Nothing beats a cool, refreshing drink on a warm day, but unfortunately if you want something that’s fresh as well as refreshing, there aren’t too many convenient keto-friendly options out there. Most fruits are too high in sugar to produce a low carb cup of juice, and even the products that use lower carb fruits tend to add some form of sugar to keep things sweet. 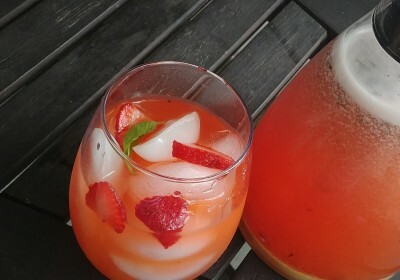 I came up with this recipe when I had a killer craving for a cold glass of lemonade as well as some strawberries and basil from the garden that I wanted to use up. Strawberry and basil may sound like an odd combination, but they actually work really well together in this drink when combined with fresh lemon juice and your favorite keto sweetener. I know people have different preferences when it comes to the balance between sweet and tart flavors in lemonade, so I’ll note that the amounts listed in the recipe below will give you a drink that leans towards the sweeter side. To up the tartness, use less sweetener, up the lemon juice to 1/2C, or add a bit of lemon zest to your strawberries. As far as which sweetener to use, the choice is really up to you! Since this is a drink recipe, you don’t need to stick to one that is granulated or made specifically to “measure like sugar” for baking. The recipe calls for the sweetness of 1/2C sugar, and most common sweeteners will provide that conversion on the package (both Lakanto and Swerve are 1:1). I personally like to use Pyure sweetener for drinks, because it dissolves easily and has minimal aftertaste. It’s twice as sweet as sugar, so I use 1/4C for this recipe. Liquid stevia or sucralose can work too, though you may want to use less water in step 1. 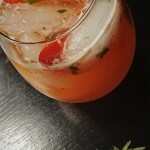 This refreshing low carb strawberry basil lemonade is easy to make, and perfect to enjoy on a warm summer or fall day. Per serving: ~15kcal, 3.5g total carbs – 1g fiber = ~2.5g net carbs. Combine strawberries, sweetener, and 1/2C of water in a small saucepan over medium heat. Cook until strawberries are softened and sweetener is dissolved, about 5 minutes. Stir in chopped basil. Remove from heat and allow to rest for ~2 minutes. Add strawberry mixture and lemon juice to a blender or food processor, and puree for 8-10 seconds. Add ice to a drink pitcher or carafe. Pour strawberry puree over ice to cool. Add remaining water (using more or less as desired) and stir to combine. Store in the refrigerator. Serve over ice, optionally garnished with strawberry slices, basil leaves, and/or lemon wedges/zest. OMG this was so good! I strained out the seeds because I’m picky but the taste was great.